I know I posted up the cool hoodies by Mike and Chris but you can still get that comfy, hip, casual style simply by heading over to either forever 21 or urban outfitters. 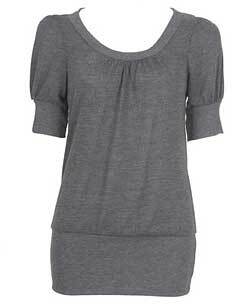 This heathered sweater top from forever 21 is only $15.80. Something to keep your bank account and closet happy. I'm really on a love fest now with the idea of buying or starting a charm bracelet for myself. While reading one of my favorite craft blogs, posy gets cozy, I came across her post on So Charmed, her friend Jodie Bloom's jewelry business. 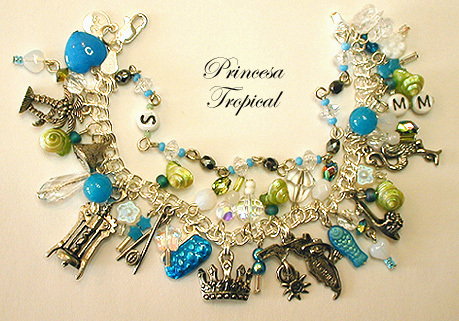 Jodie makes these fabulously ornate charm bracelets all centered around a theme. Pictured here is Princesa Tropical. You can even commission her to custom make a bracelet for you or as a gift for a friend or family. by young Hollywood. This also comes in cork, but I like the wood much better. 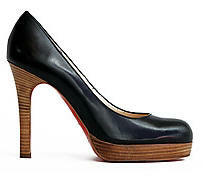 It also seems that it's all about the new round toe and it's all about Christian Louboutin. 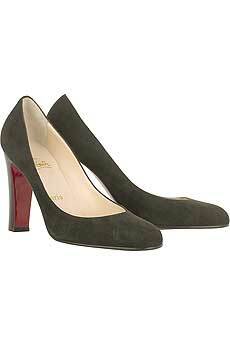 Diane Kruger in satin round toe Christian Louboutins as well. I remember when I was 9 years old and I watched the magical fairy tale of Cinderella come to life with the wedding of Lady Diana to Prince Charles in 1981. I also remember years later being in Paris for the first time in 1997 just weeks after her death and seeing flowers everywhere near where she died. Cards were written to her in every language imaginable. We all learned that fairy tales are just that, fairy tales, and that although Diana regained her freedom and autonomy, she ultimately tragically lost her life at the age of 36. But that wedding was really something amazing and I'm sure will live as the most watched wedding of all time. Most of this can be attributed to Diana's dress and that train! The super long bazillion foot train that glided through the chapel aisle. The dress was designed by the husband and wife team, David and Elizabeth Emanuel, who were fresh out of school at the time. 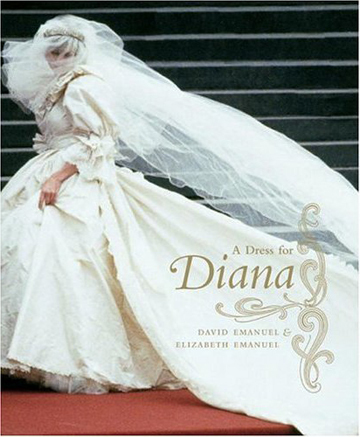 This month, the design couple have come out with a new book, A Dress for Diana ($18.87) which features never before seen sketches, photos as well as a full documentation of the entire process. A must have for your fashion library! 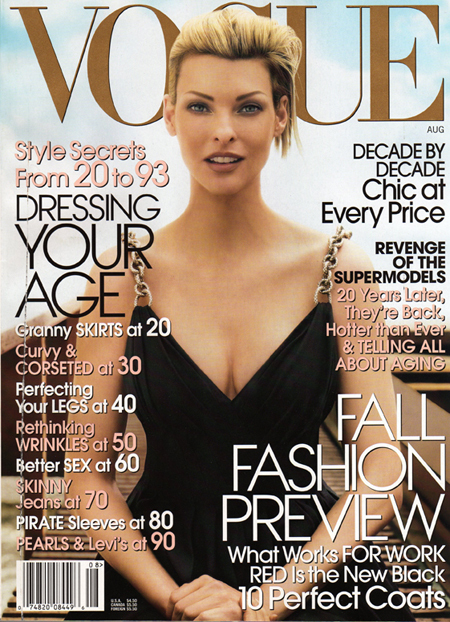 I couldn't have had a better surprise in my mailbox on Saturday than this lovely cover of Vogue with my favorite Linda Evangelista . Finally, this is the first time ina long time, there is not a celebrity who's pawning off their latest movie on the cover. There's a very interesting article inside about what all the supermodels of the late 80s and 90s are up to now and the apparent return of the supermodels for this fall who are signed on to top fall fashion campaigns. Twenty years later and these ladies still rule and you still know them by the first name (the true sign of a supermodel, the word is too overused these days) Linda, Christy, Naomi, Cindy, Claudia, and Kate. I really like how candid Linda is about her how it takes work for her to look good now at 41. (I can't believe she's 41!) There's also a great fashion spread with Christy Turlington. Please go out and buy this issue! It's a must have for your fashion magazine collection. I love this fashion spread with Christy Turlington "red is the new black". She still looks the same as she did before. I can't believe she's got 2 kids now and is 37. An inside spread showing fashion spreads of from the hey day of the supermodels. Yes that's right you heard me. Knitting + Baseball!! Yay! 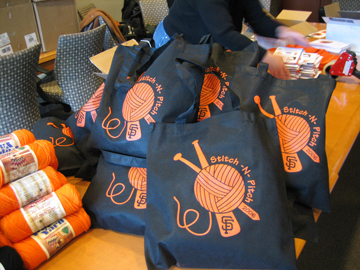 Tonight is the SF Giants first annual Stitch N' Pitch night. I've been having a blast helping out with this very special event. More to report on this tomorrow but if you live in the San Francisco area and like to knit, crochet, embroidery, or cross-sttich, bring your project and bring your friends because we are going to have a lot of fun!!! I mean what is better than crafts, baseball, friends, beers and hot dogs???? Myself and the MAKE/CRAFT team will be there for the event! Update 7/23: Check out the post pics here and the wrap up review. Mike and Chris are a husband and wife design team who decided that the indie staple -- the hoodie, needed a more downtown look. 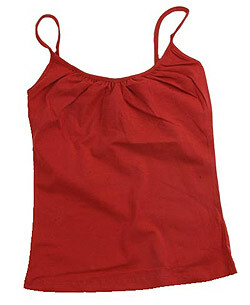 The result is chic style with the familiar soft comfort. The Ryan hoodie (on sale $74.50, orig $149) is what I am in love with. Of course, I'm in love with most of their designs so it's pretty hard for me to figure out which one to buy, especially since these are now on sale. All hoodies are for sale on this page via Le Train Bleu. UPDATE 7/20: I contacted Le Train Bleu and just heard back. These summer styles won't be restocked. (Sad I know. I finially decided I wanted the Tyler hoodie.) The good news is that the fall stuff will be up later today so check out the new goods. There's a few photos of new items coming this week. This one looks really cute and great for fall. I love the turtleneck with buttons. Sure I have way too many bags to keep straight but who can resist the cute, and i mean cuuuuute Holly Purse (left $48) and Hobbie Messenger Bag (right, $44) from 31 Corn Lane. I love the big red round buttons and rounded shape the bags take. Definitely hip and stylish. It's available now at my favorite cool shop, fredflare.com. But wait...there's more! 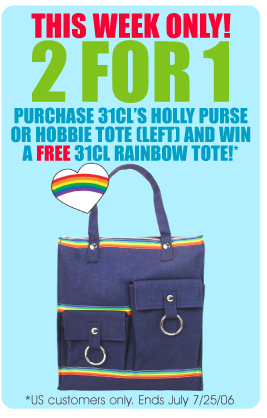 For this week only (until July 25th), if you buy either the Holly or Hobbie bags on fredflare.com, you'll get a free rainbow tote! Yes people for FREE!! You'll get 2 bags for the price of 1. Gotta love a good deal here. I love the pockets in the front of this bag. 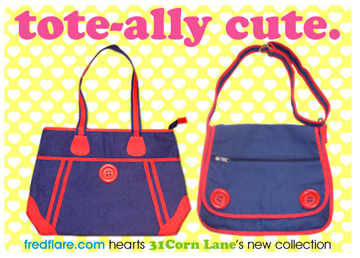 It's perfect to tote around as your knitting bag or all around town tote for the weekends. Thanks fredflare! 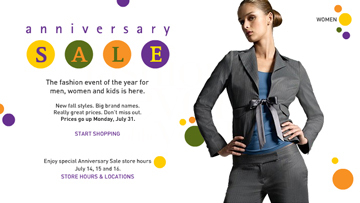 The big Nordstrom's Anniversary Sale starts today! Don't miss it. I always find some great things for fall and some major deals. You can shop online too!